Meryl! 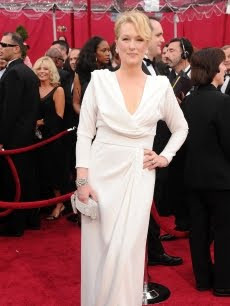 I LOVE Meryl and I thought this draped gown was great on her. Vera Farmiga is radiant in ruffles! The Marchesa gown would have been too much on most people but I think it looks great on Vera and the color is perfection. Controversial I know but I thought SJP looked great in Chanel couture. A very 1960s, Sharon Tate-esque look. Zoe Saldana! Stunning. There are no words. And now for two honorable mentions. Mostly because I love both of these women. Sandra, you peaked too early in award season but this dress was still lovely and Jessica, your look for the Vanity Fair party was PERFECTION!! Meryl was so gracious and classy! love her! I won't even go there on Charlize Theron's dress! Yikes!